The US space agency has released fresh pictures of a hurricane with a 2000km wide eye locked over Saturn’s north pole and spinning at around four times the speed of earthly hurricane winds. 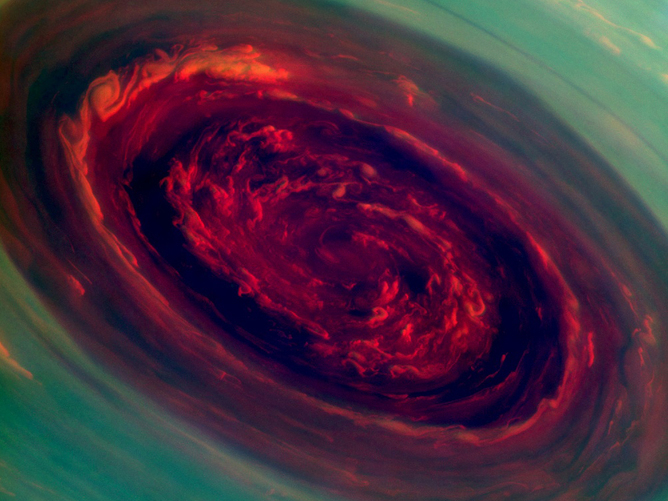 The pictures, captured by NASA’s Cassini spacecraft, show the huge hurricane being held in one spot inside a hexagon-shaped weather pattern. A video of the storm can be seen here. “We did a double take when we saw this vortex because it looks so much like a hurricane on Earth,” Andrew Ingersoll, a Cassini imaging team member at the California Institute of Technology in Pasadena said in a NASA press release. 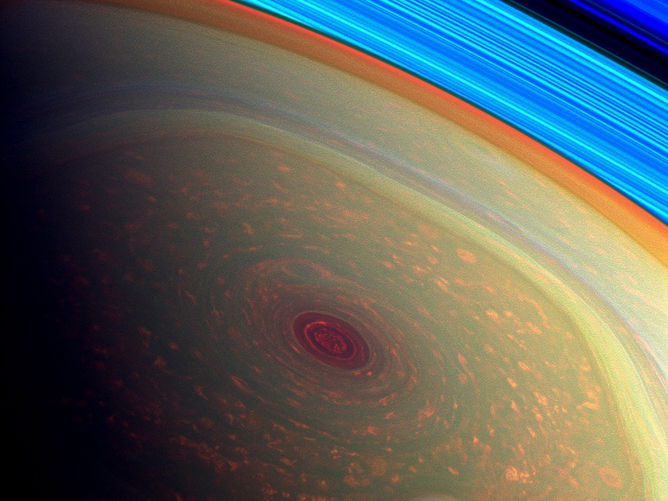 This false-color image from NASA’s Cassini mission highlights the storms at Saturn’s north pole, NASA said. The eye of the Saturn hurricane is over 20 times bigger than the average hurricane eye on Earth, with clouds at its edge moving at up to 150 metres per second. While Earth hurricanes can sweep across large areas, the Saturn hurricane was held in one place as far north as it could go. “The polar hurricane has nowhere else to go, and that’s likely why it’s stuck at the pole,” said Kunio Sayanagi, a Cassini imaging team associate at Hampton University in the US. Saturn’s north pole was previously hidden from the gaze of Cassini’s imaging cameras because it was winter in the northern hemisphere when the spacecraft arrived at the Saturn system in 2004, NASA said. Dr Alice Gorman, a space expert at Flinders University, said storms on other planets were not unusual. “You do get some fairly big weather events on these other planets. When Voyager 2 went past Neptune in 1989 they discovered, to their surprise, it was much more dynamically active in weather terms than expected,” she said. Dr Jonti Horner, a Post Doctoral Research Fellow and space expert at the University of NSW, said the pictures looked awesome. 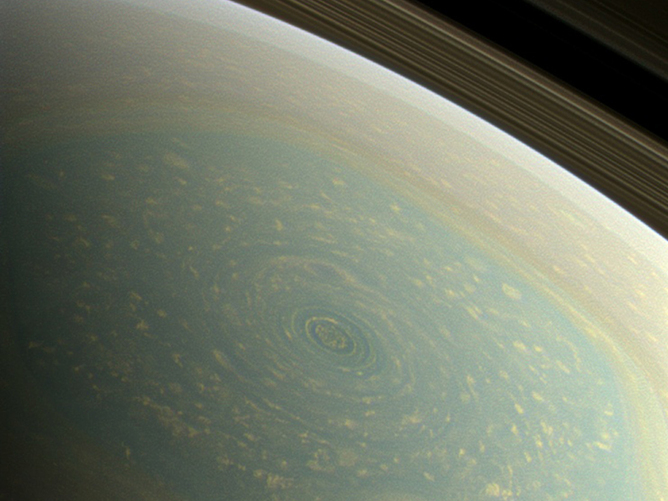 “I think the discovery is particularly interesting to me because it shows us that Saturn has one of these huge vortices at each pole – the equivalent storm at the south pole was imaged by Cassini back in 2006. The southern storm, too, was surrounded by a hexagon,” he said. Dr Horner said that the fact Saturn’s poles both feature these systems was very intriguing.